"Be Different Personal Checks" product is already in your cart. For those who live life frivolously and like to push the envelope these darling Be Different Personal Checks are festive and fun. Featuring little rubber ducks that are all yellow except the one pink one with a green bill that dares to be different, these scenes challenge you to do whatever you want and meet life head on. 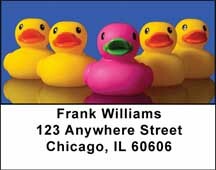 Cute and cuddly this little pink duck definitely stands out in the crowd and demands attention so go for it with these Be Different Personal Checks and let the world know that you don’t care if you are not the same as everyone else.